Finding healthy Halloween treats can be a bit challenging. So I know why many of our visitors want us to help answer this one question. 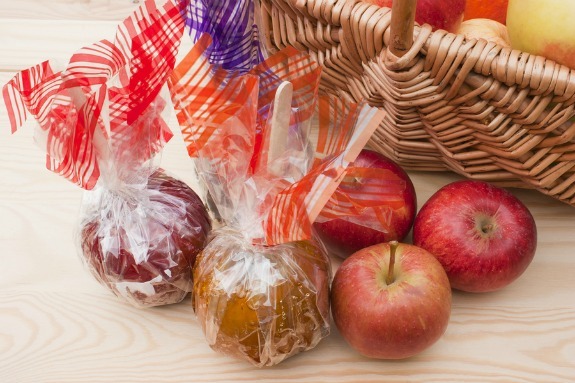 Which store bought snacks are suitable for Halloween and which are healthier for our kids? It's true most of us tend to stick with chocolate bars and potato chips when dishing out treats, so we have come up with a few more suggestions that we hope will help. Times have sure changed since I was a kid. I remember years ago when many of the Halloween treats we got were homemade. Anything from red candied apples, taffy apples, muffins, banana bread, popcorn balls, rice crispy squares and even homemade cookies were all welcomed. But as we know, it's no longer suitable to handout homemade treats for the little ghosts and goblins that come knocking on our doors on Halloween night. Most homemade treats that the children bring home are just thrown out into the garbage anyway . That's because most parents go through their child's basket of goodies making sure that all candies are safe to eat. Of course the reason that homemade treats are thrown out is because we don't know who has made them and what has been put in them and we can't take the chance when it comes to our children's safety. That is why some parents now organize Halloween parties for the kids. It has become quite a popular trend between close friends and family. 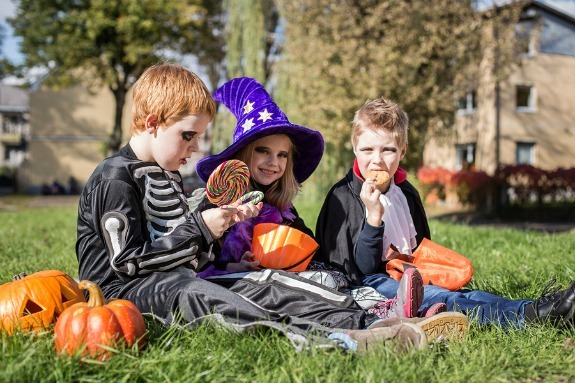 These parties are great because you can make healthy Halloween treats for the kids which keeps the sugar intake down but still keeping the party fun and eventful. Plus a house party means the adults can have a little fun and food too. But for those of us who would like to hand out treats at the door, they need to be store bought and individually sealed for safety. Now the challenge is which snacks from the store would be considered a little healthier than the typical Halloween treats of chocolate and chips? Here are some snacks we have come across that offer a little more nutrition. If you have lots of little ghosts and goblins knocking at your door some of these treats may not be financially feasible. Be on the lookout for similar no-name products that can help save you a little money. Most kids will come home with a load of candy. After all, Halloween is mainly about the candy treats. For many of us trying to convince our little ones to eat sweets in moderation can be exhausting. And an even bigger challenge is getting them to eat healthy Halloween treats. So how can we prevent our kids from eating too much candy? We would like to end this page off with a good laugh by sharing this video from the Jimmy Kimmel show. For those of you who haven't seen it before we hope you will enjoy it. In this video the parents were told to tell their children that they ate all their Halloween candy. The children's reactions are priceless.